Most of the information in this article comes from an interview with Jenny Chen of WalktheChat (details below). Thanks to her for sharing her time. WeChat is a leading mobile Chinese Social Media platform which combines the features of many of the most popular global social media and e-commerce platforms including Facebook, Twitter, Amazon, and Skype. As the name suggests – the basic function is Chat but users can also have a website, pay a bill, book a taxi, make a phone call (from January 2016 to landlines and mobiles), buy and sell, and play games. The mobile aspect is very important. For many users it is their gateway to the internet. Companies have official Wechat accounts. Games are big in China, and a lot of their users are gamers. 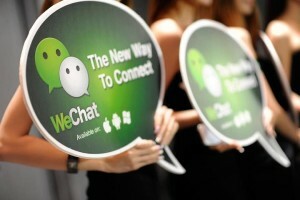 The last time WeChat published figures they had 650 million active monthly users. A Wechat store can be set up for free, and as many users never leave WeChat this is pretty obvious move if you want to reach clients in China. The Chinese market is one of the biggest in the world and highly competitive. As with other countries consumers appreciate value for money, high quality and keen prices. At the same time expensive wine in top venues in major cities can be over 10K Euro for a bottle. Big spenders still exist, even after the crisis. For companies whose products are suitable for the Chinese market, a store on WeChat may well be part of their market entry strategy.